This week I've had everything Valentine's on my mind. Not only have I already devoured a package of chocolate hearts (oops), but my posts have been all about the holiday of love. If you're looking for the perfect gift, I shared my Valentine's gift guide here, and on Wednesday I shared a cozy, yet super cute, Valentine's Day outfit here. To end the week I am sharing a romantic date night look. 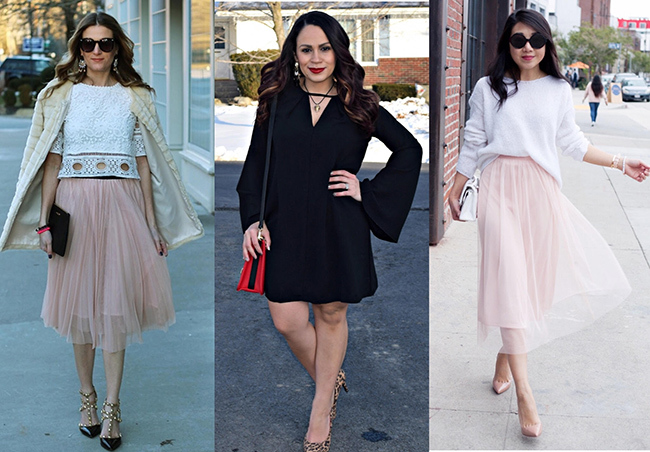 In my opinion, there is nothing more feminine than a pink tulle skirt. I've owned this one for over a year, and it has become a staple in my closet. I wanted to go for a romantic look, so I paired it with my white lace top, and loved how the two textures looked mixed together. Because it is the middle of February, I added my faux fur coat for warmth, and finished my look with beaded bracelets, which added the perfect pop of color. These bracelets are from Jacqueline Lapuck jewelry, which the designer happens to be a friend of mine. We were working together when she started her jewelry line, and it has since grown into her full time business. There is nothing I love more than seeing my friends, and other women around me succeed, so I'm very excited to be sharing her jewelry with you today, and to announce that I'm giving away the exact set that I'm wearing in these photos! Make sure to check out her jewelry line here, and you can enter the giveaway on my Instagram. Click on this photo here, and follow the instructions. I hope everyone has a great weekend. *This post contains sponsored content and affiliate links. All thoughts and opinions are my own. Thank you for supporting the brand that I love here on Threads for Thomas. The feature blogger is Jodie from Jodie's Touch Of Style. 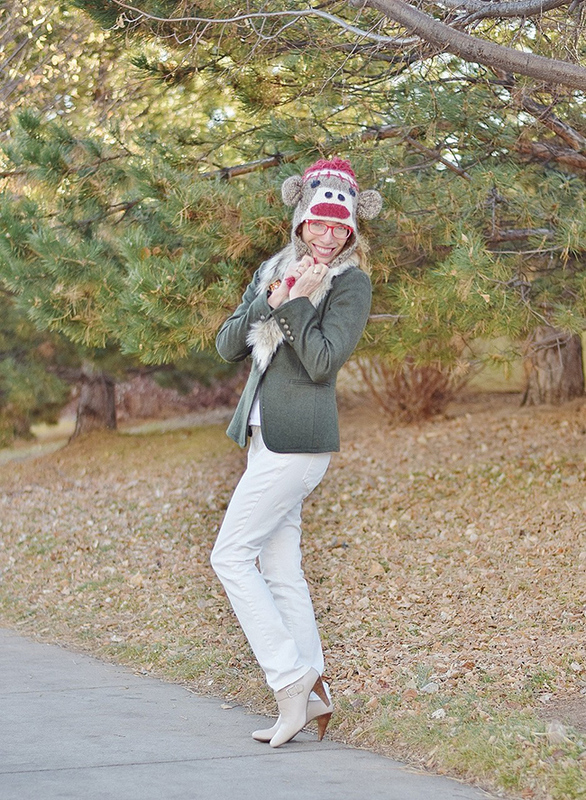 I'm loving how she styled her white jeans for the winter, and how adorable is her hat? Check out her blog to see how she, her mom, and step mom style white for the winter. That skirt!!! Adorable! Loving the detail on the top. This is such a beautiful look! I love the mix of textures! You look stunning! The top is beyond lovely - Happy VDAY!!! Love how you styled this skirt with the cropped top and the coat, all those fabrics and textures work super well together to create a pretty, light, romantic feel. Hope you enjoy a nice V-day dinner out. Such a pretty look, babe- love that skirt! Great colors! What a chique and feminine look! Also love the bracelets! Such a great look! I love the skirt, and the top is so pretty! Looking fabulous! Perfect look for a romantic date night look. I love that top with your blush skirt. Could you seriously be ANY prettier?!!! I am gushing over that skirt, but then the top too is so pretty. This outfit is just perfection! Such a great look! Love the blush tulle skirt, perfectly styled with your cropped, crocheted top. Beautiful! Blush and lace seem to have become just as ubiquitous for valentines day as red hearts, but I suppose it's with good reason. Hope you have a wonderful weekend! So pretty. I love the blush pink and think its awesome you and Sheree have light pink tuelle skirts. Just gorgeous. I love your lace top! What a beautiful and romantic look. I love and want everything, especially your Chicwish pieces. You styled this so well, Rachael. That top is gorgeous and I love the colorful bracelets that your friend made. Good luck to her on her business! Love your outfit. I am a huge fan of tulle! This outfit is stunning! Love the tulle skirt you are rocking! I love this blouse and skirt combo! So beautiful!! I have a similar skirt that I need to pair a crop top with! That lace top is so pretty with your pink skirt! Happy Valentine's Day! Such a gorgeous skirt - I adore it with the white lace top! Perfect for today :) Happy Valentine's Day, pretty! Such a feminine and romantic look. Perfect for Valentine's day. Happy Valentine's Day beautiful. As I mentioned a while back I adored this outfit head to toe. It is indeed very romantic. The skirt, shoes, top and coat are all stunners, Rachael!